If you only had one day to explore the rolling green hills of the Dandenong Ranges, what would you do? Well, I compiled a list of the sights we were able to see in just one day recently. Luckily, the Dandenongs are located only an hour’s drive from Melbourne so I’m sure we’ll be back to explore some more. This area is the perfect escape from the city’s major hustle and bustle. At 9 a.m., our first stop was at Piriandas Gardens, a beautiful woodland garden containing a unique collection of non-native plants and trees. Not much was blooming in early September yet, but the terraced gardens were full of green ferns and shrubbery. Apparently, this garden is particularly beautiful in autumn when the trees change colors. We happened to see several Sulphur-crested cockatoos and two Kookaburras here. The gardens were created by a local couple, Harvey and Gillian Ansell, in 1959 on 28 acres. On their annual overseas holidays, the Ansells bought and imported new and unusual plants that were planted amongst the native rainforest species. In 1977, the Ansells donated the garden to the Victoria government. Another lovely garden spot is the National Rhododendron Gardens, which was established in 1961 by the Australian Rhododendron Society. In spring, these gardens are home to brightly colored blooms of rhododendrons, azaleas, camellias, cherry trees and daffodils. The rhododendrons usually bloom from June to early December. 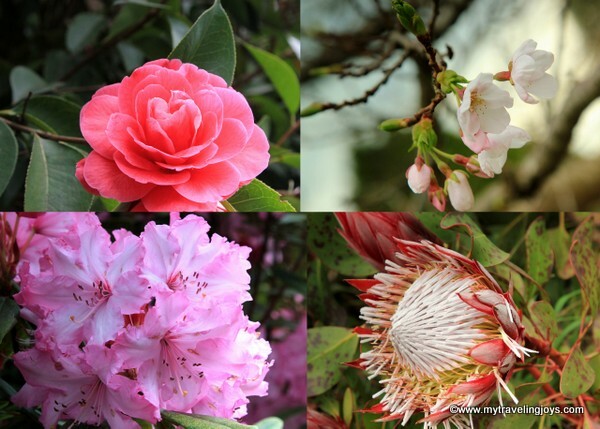 Did you know there are 950 species of rhododendrons in the world? Nope, I didn’t either, but this Victorian garden contains approximately 550 of these species. We spent a little over an hour walking through the garden and admiring the pretty blooms. Note: the free gardens are much bigger than they look and include a 5-km walking trail around the perimeter. Here’s a walking trail map. We saw this cheeky Kookaburra literally swoop down and steal some chicken from a picnic table! The Olinda section of Dandenong Ranges National Park covers 790 hectares between Olinda, Kalorama and the Silvan Reservoir. Until 1968, huge Mountain Ash trees were felled for timber and used in the growing city of Melbourne. Now, the remaining trees are home to several Australian bird species. From the Olinda Falls carpark, it’s a relatively easy (but muddy) walk, perhaps 10-15 minutes to access the upper falls and then 5 more minutes or so to the lower falls. 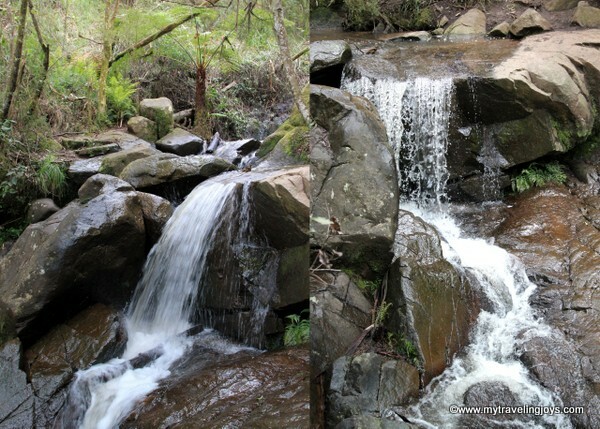 These were my favorite waterfalls we saw in the Dandenongs. At the lower falls, we sat down on the wooden bench and enjoyed a mid-afternoon picnic lunch. I recommend that you do the same to avoid the crowds at the picnic grounds by the carpark. We saw dozens of cockatoos and lorikeets here, but they were perched too high up in the trees to get any good photos. Here is a walking map of the area. Does anyone know what these metallic blue bugs are? Such a strange color! Touted as having the “best view of Melbourne,” the Mt Dandenong Observatory was slightly disappointing for us. First, you must pay 6 aud for the car park, and then you must navigate around dozens of people that don’t know how to park a car and throngs of families going to and from their cars here. Crowds really aren’t our thing, and on this Saturday it was particularly awful. The café was packed and the main restaurant was closed for a special event. At least my glass of white wine was only 7 aud, and we briefly enjoyed the sweeping view of Melbourne and the surrounding Victoria region. 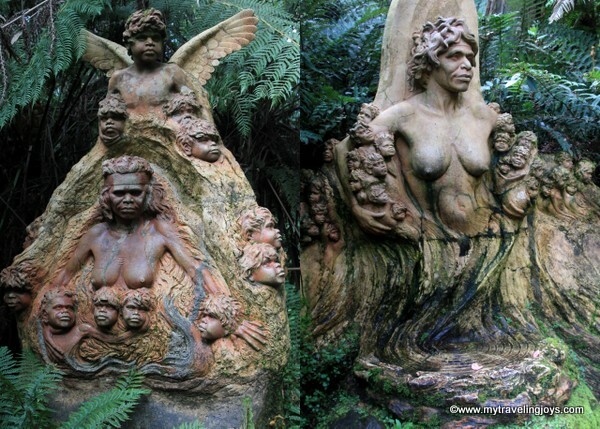 If you want a beautiful, tranquil place to reflect on life, stop at the William Ricketts Sanctuary located just down the road from the hectic observatory. Just as my good Melburnian friend recommended, this sanctuary was a true delight! This sanctuary was created way back in the 1930s by local sculptor William Rickets when he bought a four-acre bush block and called it Potter's Sanctuary. 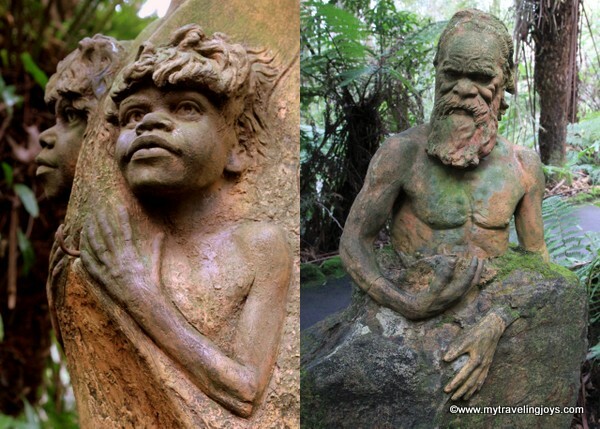 Over the years, he made frequent trips and befriended the Pitjantjatjara and Arrente Aboriginal people, whose traditions and culture inspired his sculptures. In the 1960s, the Victorian government heard about his work and bought his property and additional adjoining land. Ricketts lived at the sanctuary into his nineties and continued to create his sculptures until his death in 1993. This sanctuary is truly a magical place! I felt like the sculptures, half hidden among the ferns, were literally coming out of the ground and becoming part of the surrounding forest. It’s really tragic to think how the Aboriginal people were treated when the first “white people” arrived in Australia and then destroyed acres and acres of land and killed thousands of local animals such as koalas, kangaroos and wallabies. As the afternoon light faded, we made our final stop of the day at Sherbrooke Falls, which includes a 2.4km flat trail roundtrip. (Click here to see a trail map of the area.) We entered the trail off Terry’s Avenue and founded it to be an old, muddy logging road. Along the way, you’ll see the tons of verdant green ferns (which remind me of Jurrasic Park) and the region's finest mountain ash trees, some of them up to 200 years old. I found the falls slightly disappointing compared to the Olinda Falls, but apparently they are the most inspiring after heavy rains. Have you visited the Dandenong Ranges? Do you have any other tips for our next trip? For a long time now, Victoria has been known as the 'Garden State' of Australia. With a plenitude of parks and gardens situated all through all significant urban communities and towns everywhere throughout the state. With Melbourne being the Capital City, it is honored with some glorious stops and gardens everywhere throughout the metropolitan zone, not only the well known ones nearer to the CBD.